The growth of the Internet and the rise of large scale computer networks means that the humble network cable is more important than ever before. Cables are also the obvious choice for small scale applications, such as connecting together two computers in the same room. Despite the huge advances in wireless technology and communications infrastructures that have swept the world, actual physical cables are still used in the majority of computer networks. The programming of servers and network computers to use these different cables is an important skill that will be needed by the information technology industry for a long time to come. Network cables are used in all computer networks, as a way to connect computers and computer peripherals together in a single information environment. Whether they are being used over the huge scale of the Internet, or the small scale of a single room or office; the various kinds of network cable have become an essential link in digital communications. There are many people around the world who are employed as network administrators and technicians, to program and engineer servers and computers in order to create working computer networks. The programming and tweaking of servers and computers is vital so that they can work with the various different kinds of cabling technology that are available. 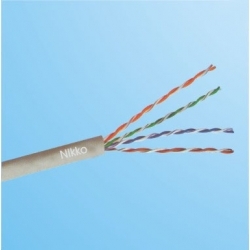 Some of the different kinds of cable that have either been designed specifically or adapted for computer networking include: twisted pair cables, optical fiber cables, coaxial cables, patch cables, Ethernet crossover cables, and even power lines. While the technology involved in these cables is generally flexible and able to work in a number of different situations, servers and computers often need to be programmed to accept the information they provide. Completely different cable technology can be used to perform the same duties within a network, meaning that each computer involved may need to be set up individually.